Six full days in Italy. Unbelievable landscapes, rainbows, shopping, and wine. Perugia, Umbria, Assisi, Cortana, places I’d never heard of but had seen in movies like Under the Tuscany Sun and on CNN during darker times. The locals said the air was unseasonably warm for autumn at eighty degrees. Somebody mentioned a weaver lived up the hill from our quaint hotel. 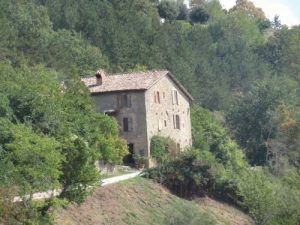 Did I forget to share that we were a group of 17 women who had traveled to Umbria for a yoga retreat? (Yoga, not for me and apparently not for a few others on this trip). A couple of us walked (hiked) to the weaver’s house with the sun heating our way. Let’s just say that eight felt more like one hundred and ten degrees. “Ciao!” the weaver greeted us with a smile. We instantly realized she only spoke Italian. We only spoke English. 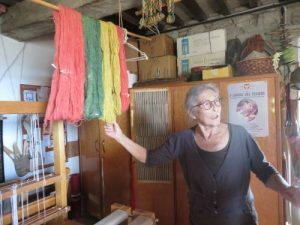 Somehow, we managed to communicate, learning that the weaver made every pattern, dyed all of her materials (strings, wool, yarn, silk) herself, and as we noticed—she used several types of old-school looms to make her creations. Creativity at it’s finest. Every loom, machine, tool, and piece of equipment contained a work in progress. More than a weaver, she was a crafter, an artist, a lover of imagination and creation, a lover of art. On the ground level, with all windows open, surrounded in stone—the natural cool air was a welcome relief. The more I looked at her studio/house, the more I saw. Scraps of paper taped on walls with patterns she’d created, a closet full of completed works, an eye made from stone hung above the sink, and samples of thread with colors she’d created were attached to the wall near the entry. At the time, I didn’t know she and I shared a similar fate. I left the weaver’s house with a smile on my face after spending one hundred euros on a blue and gray scarf she had made from silk. She truly enjoys weaving and that joy was contagious. “It’s a labor of love.” She managed to communicate to me in broken English and partial Italian. She had found her passion and the weaver truly enjoyed sharing her art. Later, much later in our trip, during our last evening, I learned that the looms were frozen in time. The Weaver had stopped creating. She had been battling cancer. Breast cancer that she had beat years before had returned. This time the disease had crept into her lungs. On a better note, she had completed her last treatment and things were looking up. Now, if she would just fire up the looms once again and get back to what she loves, life would be perfectly imperfect.